Wouldn't life be easy if you had a step by step guide on how to get through it? While Maya Van Wagenen doesn't have a guide to life, she does have a guide to being popular, and for a teenager that's the same thing. Popular: Vintage Wisdom for a Modern Geek is Van Wagenen's real life account of a year spent living by the rules of Betty Cornell's Teenage Popularity Guide, first published way back in 1951. Van Wagenen's social experiment sees her wearing a girdle, changing her posture, introducing herself to new people and donning make up in an attempt to be popular at the "armpit" that is school. This is a frank and funny book, which draws you in immediately. I loved Van Wagenen's voice, which was fresh and sounded reassuringly like that of a 13-year-old (that's how old Van Wagenen was at the time of the experiment). And like a teenager there was plenty of minor drama which at that age seems like it's the be-all and end-all - a crush on a cute boy, dealing with the popular kids. 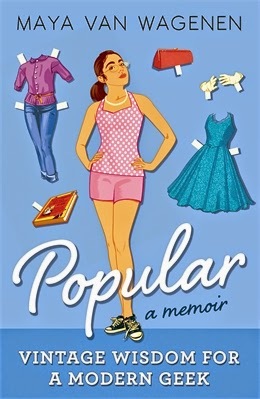 Popular is at its best when Van Wagenen is talking about the experiences which nearly every teenager goes through in their life, from school to friends to family (although obviously the book is very American). Added into that, Van Wagenen's experiment adds a layer of tension and hilarity, as she goes through her school days wearing pearls and trying to act like nothing has changed so as not to tip people off to what she doing. As well as school, Van Wagenen's family life is also full of love and humour, from her younger sister Natalia, who has autism, to her annoying but loveable brother, to her occasionally eccentric dad and her beautiful mother. It's her family unit which ensure that Van Wagenen can go through with her experiment for a full year. Where the memoir slightly falls down is on the more serious topics. Van Wagenen's relationship with her teacher Mr Lawrence, who has terminal cancer, is touching and definitely worth hearing more about. And Van Wagenen mentions gang and drug problems in her school and hometown plenty of times throughout the book, but the issue is never explored properly. I can understand that both situations were a part of Van Wagenen's life, and so needed to be included, but at times it felt like a mention of them was just thrown in and then forgotten about. They don't quite fit into a diary about becoming popular, but at the same time they can't be discarded. It's a conundrum that's handled ok, but not brilliantly (and that's more to do with the editing than the writing). Aside from that, though, Popular is a great read. Of course, there are lessons to be learned from what Van Wagenen goes through, and there's a certain amount of light preaching about popularity, but it all works pretty well. Not only is Popular an enjoyable book, it's also the tale of a brave young woman who decided to do her own thing, and succeeded. And that's more inspiring for all the legions of teenage girls out there than becoming popular.